Long time no see but it is time for another xhtml/css strict free template. Rounded corners all around. I love them! This is blue again doh. Like always blue is my favorite color. It has white background for content and a little orange that I find pretty lately. 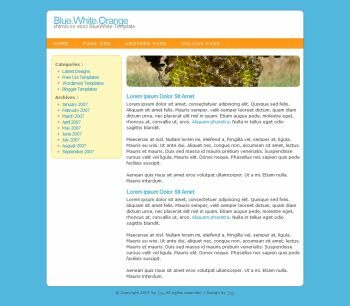 It is 2 column fixed width css template fixed width and I hope you like this one and don't hesitate to email me with your websites where you use it if you use it. Till next time, be good.